This is a list of the ponies I would like to collect. I'm happy to do trades (a pony on my sale list for a pony on this list). Two Important Details: 1) I collect loose Ponies unless otherwise specified. If you want to trade I'll need photos to prove quality. 2) Hair is a BIG deal for me. Hair needs to be soft and smooth. If there is ANY frizz, dryness or breaking, make sure to mention it when trading please. Ponies are listed in order of what I want. Most desired are at the top. Want to Trade for one of my Ponies for Sale? Let me know! Pink with Red, Magenta, Blue and Violet hair. Winged Heart with Ribbon trailing down leg. Pink with Green and Magenta hair. Magenta Tipped wings. Floral Emblem. Pink with Red, Magenta and Blue Hair. Blue with Dark blue, light blue, red and white hair. Hot Air Balloon in Clouds Emblem. Yellow with Scarlet glitter hair. Sunburst emblem with Ruby gem. Yellow pony with Teal Green, white, and Magenta hair. 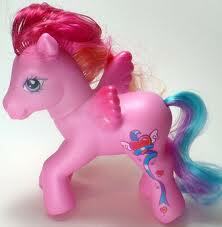 Pink pony with blue green Hair. Either pose. Yellow pony with magenta and purple hair. Pink with bright blue tinsel mane. Yellow sea shell with turquoise Gem. Lavender Pony with Lavender mane. the only birthday pony to be reproduced in Ponyville. she's adorable. Skywishes is one of my favorites. I have her McDonalds pose, but I'm still hoping to get this one. 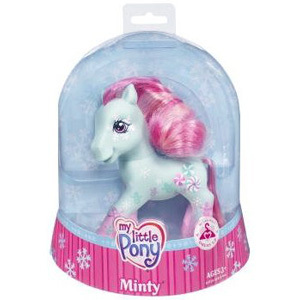 I got this pony for my daughter back when they first came out and now I wish I'd picked up a spare to keep in box because her paintwork is sublime!